You know, sometimes the projects you dread most are the ones you end up being most proud of. I have so many orders lined up and a couple of them were for items I haven’t come up with patterns for. When I first started making hats, I bought a lot of patterns. As I grew to really understand my craft I started working out my own. I still use the other patterns but it’s definitely a proud feeling when you come up with one of your own. 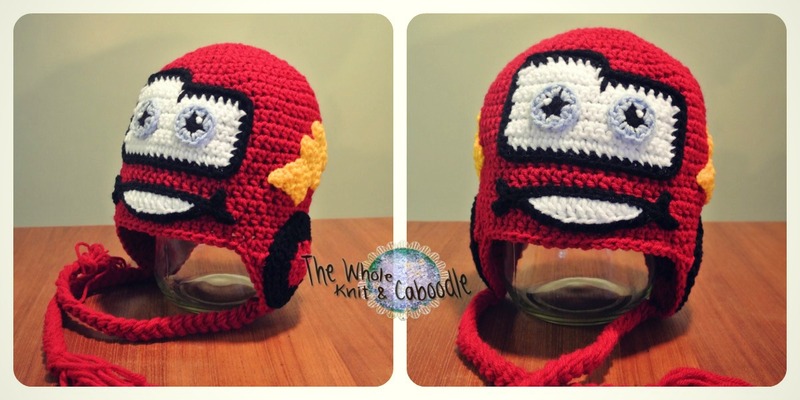 I had a couple of orders for Lightning McQueen hats and because I’m so busy I was going to buy a pattern. I didn’t really see anything I was excited about so I bit the bullet and wrote my own pattern. The notes I made are barely legible so I’ll have to type them out properly when things slow down a bit. I’ll send it for testing and it should be for sale in my craftsy shop in the New Year. I’m pretty happy with him, what do you think? Hi,this is gorgeous!! !I’ve got a little nephew who’s “Cars” obsessed and also against having any type of protection/hat on his head so with the cold weather it’s tricky!I know he’d love that hat and never get it off his head,any chance you’ll upload the pattern for it soon? ?Thanks!